The pound ended Wednesday in negative territory, and in doing so, officially entered its longest losing streak since the financial crisis. It has now dropped for 11 consecutive days against the dollar. Factors hitting sterling include the rising risk of a no deal Brexit and the currency crisis in Turkey. The bad news for investors and Brits going on holiday is that things don’t look likely to get better any time soon. You can track the pound on Markets Insider. LONDON – The pound is on its longest losing streak against the dollar since the depths of the financial crisis as a perfect storm “unravels” the UK’s currency. After a strong start to 2018, the pound has slumped in recent months and is traded below $US1.27 for the first time in 14 months on Wednesday. Sterling hit a low of $US1.2669 during mid-morning trade. By losing ground on Wednesday, the pound marked 11 consecutive days of losses against the dollar. That is a losing run not seen since 2008 during the depths of the global financial crisis. 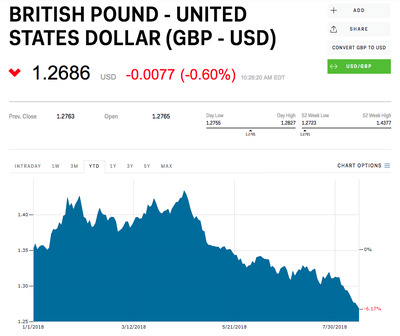 “The pound seems to be unravelling against the US dollar due to a confluence of factors,” ING currency strategist Viraj Patel told Business Insider on Wednesday. Markets InsiderThe pound has dropped more than 6% against the dollar since the start of the year. Patel identified three separate drivers of recent weakness: first, the continued uncertainty around whether or not Britain will secure a Brexit deal; second, the fact that August is generally a weak month for the pound; and third, geopolitical concerns, particularly around trade wars and the growing crisis in Turkey. On the first point, a ‘no deal’ Brexit is seen almost universally as a substantial negative for the UK economy and, by extension, the pound. If Britain can’t secure an agreement with the EU on post-Brexit trading arrangements by next March, the UK will crash out of the EU and trade between the two could slow or stop. The likelihood of a no deal Brexit appears to be rising, with UK Trade Secretary Liam Fox recently saying there is a 60% chance of it happening. Foreign Secretary Jeremy Hunt said this morning there would be a sharp fall in the pound in the case of a no deal outcome. In late July, Thu Lan Nguyen, a currency strategist at Germany’s Commerzbank warned that the pound would likely suffer losses similar to the night Britain voted to leave the European Union. “I would anticipate at least a reaction to the extent we saw after the referendum,” she said. Until there is at least a little clarity on a post-Brexit trade deal, the pound is unlikely to rally much. But that story is not particularly new and Patel believes global uncertainty has played as much – if not more – of a role in the renewed slump of the pound over the last few days. Emerging market currencies have seen a big downward spike in recent days, spurred by the crisis in Turkey where the lira lost 25% of its value in just a week. The lira’s initial slide came amid rising tensions between the US and Erdogan over trade. US President Donald Trump authorised increased tariffs against Turkey on Friday in response to Turkey’s unwillingness to release an American evangelical pastor, Andrew Brunson. “The pound, therefore, has two sources of risk premia,” Patel added. “Domestic Brexit and global political uncertainty. Both are at the highest they have been for a while now – making the pound particularly vulnerable.